Fiber gummies help you to curb your appetite thanks to slow-digesting kinds of fiber. This kind of dietary supplement is taken with lots of water, which in turn transforms into a gelatinous substance. This helps you avoid overeating and this also helps you limit your daily calorie intake. As a result, fiber gummies are your allies when it comes to effective weight loss. It's also worth knowing that fiber gummies are good for your overall health and your digestive system in particular. Fiber gummies also improve control of blood sugar preventing blood sugar spikes and storing of a new fat. This kind of supplement helps you get rid of excess toxins, and fat. We all love to eat delightful snack treats, but they unfortunately add inches to our waistline. Now, there's a new fix to your weight loss woes that lets you to enjoy a snack without guilt. 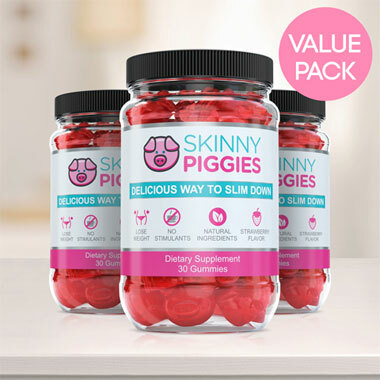 Skinny Piggies tasty gummies are designed to help you get rid of carb cravings and keep you feeling more full, while helping your body burn fat in the process. Losing weight is not difficult to get: Take in less calories than your body burns off and your body will start losing fat, it's so simple! However when you start reducing calories, and hunger and appetite become extremely hard to manage. 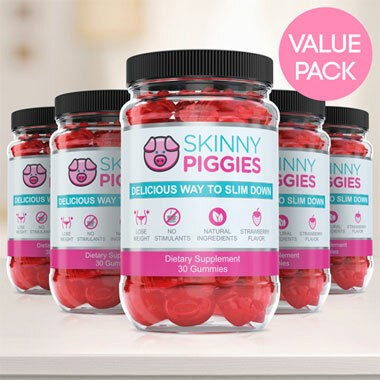 This is where Skinny Piggy Weight-Loss Gummies can help you! These savory hunger suppressant gummies are developed to help you to stick to your dietary plan by reducing hunger. The concept is quite simple. Appetite is regulated by two key ways: the number of calories you consume and the feeling of food in your stomach. After a large meal, your stomach stretches from the food pressed up against the walls, that makes you feeling satisfied and you stop eating. When you take one Skinny Piggy 20 to 30 minutes ahead of your lunch with a tall cup of water, it will gently form a soft gel, activating food sensors in your stomach, telling your brain you just had a big meal. So that when you have your meal later, you are partially full and eat much less calories. This way you can stop appetite and keep eating less, without seeming like you're eating less than before. The gel enables your stomach to empty slowly makeing you full much longer. The sooner you feel full, the less likely you will continue eating and that enables you to eat fewer calories. The soft gel will slow down the absorption of carbohydrates and that flattens the level of blood sugar. By reducing spikes in the blood sugar level you stop those intense cravings too. Reducing blood sugar spikes in your daily life helps prevent food calories from being stored as body fat. By putting you in weight loss mode, our fiber gummies help your body lose fat. Skinny Piggies have zero chemical additives: you can actually pronounce each of the key ingredients. 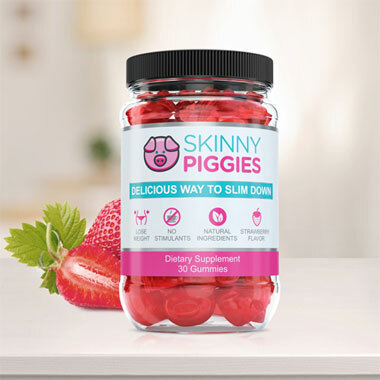 The balanced, all natural ingredients used in Skinny Piggies also have further healthy benefits for example support for strong nails, powerful anti-aging benefits, and glowing skin. Skinny Piggies include no stimulants and zero harsh chemicals. No stimulants means no burning out and you can take them at night too. No harsh chemicals means these gummies are gentle on your stomach. And finally, what other diet pill is as tasty as a fruit gummy? You'll really love snacking on them so forgetting to take your health supplement won't be a stumbling block. They are simple to use and anybody can get started right now. Try just one and we're sure they will become a treat you look forward to.